Let’s face it. There’s one big “Pro” to allowing your dog to sleep in bed with you — it’s heart-warmingly delicious to curl up with your best buddy! But is sleeping with your dog or cat in the best interest of either of you? The answer is, I’m afraid, “no” for several reasons. Having our pet in bed with you disturbs your sleep. The little darlings like to nestle up to you, sleeping between your legs or cuddling up to your face. It’s oh-so-wonderful at first, but this can prevent you from turning over or sleeping peacefully through the night. Your pet may well get in and out of bed during the night, interrupting your sleep whether you’re conscious of it or not. Turns your pet into your alarm clock. Dogs and cats have their own sleep cycle, but don’t expect that it will coincide with your own! If you allow your puppy in bed with you, be prepared to wake up with he’s ready to start the day. Most pet owners who sleep with their dogs and cats say ‘goodbye’ to sleeping in on the weekends! Certainly if you have any inclination towards allergies or asthma, it’s unwise to let your dog or cat sleep with you at night. Even the most well-groomed cats and dogs have a certain amount of pet dander. And if you allow your pets outdoors, there’s always a chance of fleas or other parasites. Dogs and cats prefer consistency. Dogs, in particular, enjoy having their own “den” where they feel safe and protected. Even cats tend to have certain places they call their own. But inevitably there will be times you won’t want your pet in bed with you, and you’ll force your cat or dog to relocated, however temporarily. Who wants an animal in bed when you’re sick with the flu? And if you go away on vacation, your dog or cat may feel lonely and anxious to find that you’re not there in bed where they’ve become accustomed to sleeping with you. It’s best to use a crate or other bed for your pets rather than your bed, so it will always be available as their peaceful place at night. Getting up and down from your bed may lead to injury. Your adult dog or cat may have no trouble at the moment jumping up to your bed, and down again in the morning. But pets may find that a greater challenge as they age. Consider that the height of most beds are several times that of your dog or cat. Once they get used to sleeping in bed with you, it’s harder to re-train them to sleep elsewhere even if it puts strain on their older joints to get in and out of your bed. Yes, there are numerous portable pet stairs on the market to help, but why incur the expense and clutter up your bedroom? Decide to designate a crate, bed or other spot for your dog on the floor now for a lifetime of restful sleep for you both. You might accidentally roll over on your pet. You can’t imagine you ever would, but unfortunately some pet owners have found that they have hurt their dog or cat by rolling over on them during the night, or unknowingly knocking their pets off the bed. Older animals with brittle bones, and small dogs, like Cavalier King Charles Spaniels, that weigh a fraction of what their humans weigh can easily be harmed unintentionally. I made the mistake of allowing both my Cavalier King Charles Spaniel, Bentley, and my cat, Matilda, sleep in my bed. I regretted it with Bentley in particular because he had patellar luxation and arthritis as time went by that was easily aggravated by his getting up and down from my bed, even with the benefit of pet stairs. My cat, Matilda, was a restless sleeper and woke me up several times a night with her prowling, and early in the morning when she was ready for her breakfast! My next pets will have their own (undoubtedly luxurious) places to sleep on the floor and outside of my bedroom! 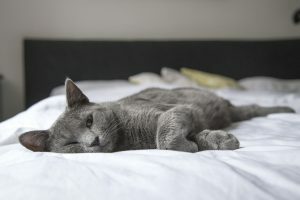 Here’s another article claiming that dogs and cats who are accustomed to sleeping with their owners may demonstrate destructive behavior when they are put out for a night. My Cavalier is allowed on the bed but he prefers his carrier by my bed for sleeping🐶. Every dog is different but mine likes to be safely sleeping in his “den”.